After Stanford suffered another disappointing loss this past weekend to a pass-happy Washington State, Cardinal fans can at least rejoice in some alumni who performed well in this week’s NFL action. 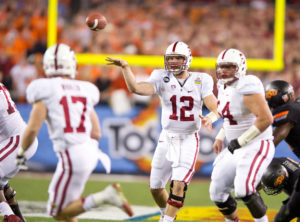 Colts franchise quarterback Andrew Luck, Stanford’s marquee Sunday representative, performed exceptionally for Indianapolis, who picked up their second win on the 2016 campaign. Luck threw for 322 yards and two touchdowns in the 29-23 win over a struggling Chicago Bears team that now moves to 1-4, good for last place in the NFC North. Indy’s defense also features Stanford alumni David Parry and Henry Anderson, who combined for three tackles while allowing 23 points in a shaky performance against a weakened, Brian Hoyer-led offense. Outside of Indiana, Cardinal alums made some decent contributions around the NFC East, including Eagles tight end Zach Ertz, who recorded three catches for 37 yards in Philly’s first loss of the season. Washington defensive end Trent Murphy stepped up for his defense and finished a deconstruction of the Ravens’ offense with three tackles and 10 points allowed. Washington now moves to 3-2 on the season in a highly contested NFC East. Other than the NFC East and Indianapolis, Stanford alumni remained relatively muted throughout the league. Packers receiver Ty Montgomery and Falcons tight end Austin Hooper each recorded one catch, while their respective teams went on to victory. Down in Santa Clara, linebacker Shane Skov had another one-tackle game while backup offensive lineman Joshua Garnett continued to see playing time in the 49ers’ loss to conference rival Arizona Cardinals. Tight end Austin Hooper caught only one pass for 14 yards following last week’s career contest, where the rookie recorded his first touchdown catch in the league. Atlanta continued its hot start to the season by toppling the defending champions on the road, handing Denver their first loss on the season. The Seattle Seahawks remained rested during their bye week, meaning that both cornerback Richard Sherman and receiver Doug Baldwin stayed out of competition over the weekend. Head coach Pete Carroll and his “Legion of Boom” will host the aforementioned high-scoring Atlanta Falcons pass attack led by standout receiver Julio Jones in next week’s pro matchups. Contact Lorenzo Rosas at enzor9 ‘at’ stanford.edu.